As you may recall from the beginning of our story as a couple, FI and I met in college, but more specifically, in the choir. Not the church choir, but just the concert choir. FI and I love music. LOVE LOVE LOVE music! In fact, as you may also recall, I am a former music teacher, so that's how much I love music. Now, when it comes to music for the big day, we have kind of been putting this off. We know that in terms of the reception, we want a lot of the Top 40 hits to be played, censored, of course. I don't think I want my extremely Catholic grandfather listening to Cee Lo Green's non-censored version of "Forget You." In addition to Top 40, I am totally obsessed with music from the 80s. And when I say totally, I mean totally. I have so many 80s playlists, and all of Billboard's Top 100 Hits from the 80s (Actually, Billboard's Top 100 every year from 1970-1999. Awesome collection - you should get it!). And then, I think to please some of the older crowd, we'll have the DJ play some of the more popular tunes from those times as well. We trust our DJ to come up with some good ones. What I really wanted to talk about, however, was the music for the special things, like the entrances, and the first and last dances. What you should know, is that my favorite artist is Josh Groban, and FI's favorite artist is Phil Collins (Don't Judge). And while we both love music specifically from those artists, we aren't sure if those are ones that we want to use for our special songs. I also like Michael Buble, and all that too, but at the same time, we don't want to use the same songs as everyone else (Why do I care so much about that? Ugh!). So, here are a few I'm considering. Entrance Song - Only FI and I are being introduced into the reception, so this is the only song that we have to choose, but what do we choose? First Dance - Something from Josh or something from Phil? Or what about this one? Are the lyrics too risque? Father/Daughter Dance - I really wanted to do Boston's "Amanda," but then I read through the lyrics, and I'm not so sure that they are appropriate for a Father/Daughter dance. Thoughts? If not, maybe I'll have my dad choose. That would take the stress off my shoulders, at least! Mother/Son Dance - I am leaving this one up to FI and his mom if he wants to involve her. I think it's going to be a tear-jerker. They have such a strong and special relationship. FI cries about it just on mention of the Mother/Son Dance. Last Dance - Michael Buble's "Save the Last Dance for Me" is a contender, even though it's obvious. But, are there any other suggestions? So, what are your thoughts on the music selections? Am I at least heading in the right direction? Do you have any suggestions or concerns with the picks so far? FI and I are in an interesting scenario with our wedding invitations. Because we are hosting the wedding, our parents names will not be listed on the invitations. This means that traditional invitation wording will not make sense to use in our situation. FI and I are also not getting married in a religious ceremony, so all of the wording that has some religious affiliation would also not make sense to use. We wanted to find something that wasn't too overused, but at the same time, wasn't too mushy, awkward, dorky, or weird - I know, I'm using such technical terms, aren't I? I ended up finding our wording at Invitation Consultants, but before I reveal what we have chosen, I wanted to show you what we did not choose. Golf has nothing to do with our relationship, and I'm not exactly sure I would want the word "wood" in quotes on my wedding invitation. Especially with our group of friends. That would never fly. So yeah, those are SO not us. But, if they are you, by all means, please use them on your invitations. So, what are your thoughts? Is this too cheesy? Does the wording make sense? Can you actually picture this on a wedding invitation? Wow, sorry about being MIA for the last few days. My Spring semester for school ended today, and I had some assignments and projects that needed to be finished. Now that those are done, though, I can get back into regular posting. Sunday afternoon, after going to a few open houses (Did I mention we're house hunting? Well, if I didn't, we are. And it's so much fun! ), we had our tasting with the caterer. Russell Morin only does tasting after you have booked them and paid a deposit on their services, which was fine with us. And in fact, that actually worked out well for us, because we had a chance to look at their options, choose our wedding day menu, and taste what we have chosen versus some of their standard meals. 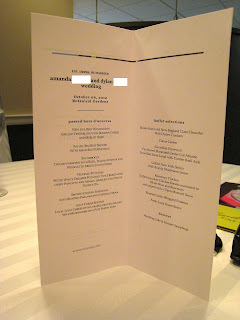 When FI and I were originally in talks with caterers, one of the things that really sold us on Morins was the food choices, and how delicious they sounded. We spent many hours coming up with our wedding day menu, and after this tasting, I have to say, we are so excited to eat this food again in October. Now I'll get to the good stuff - the actual tasting - with PICTURES! When we got to the catering office, we were invited to our private room for the tasting. They had a round table in the center, as you see above, with examples of their china on one wall, and actual tablecloths hanging on the other side. The china was gorgeous. My favorite was this one, but we decided against paying the extra fee on plates, since ours were complimentary with booking. 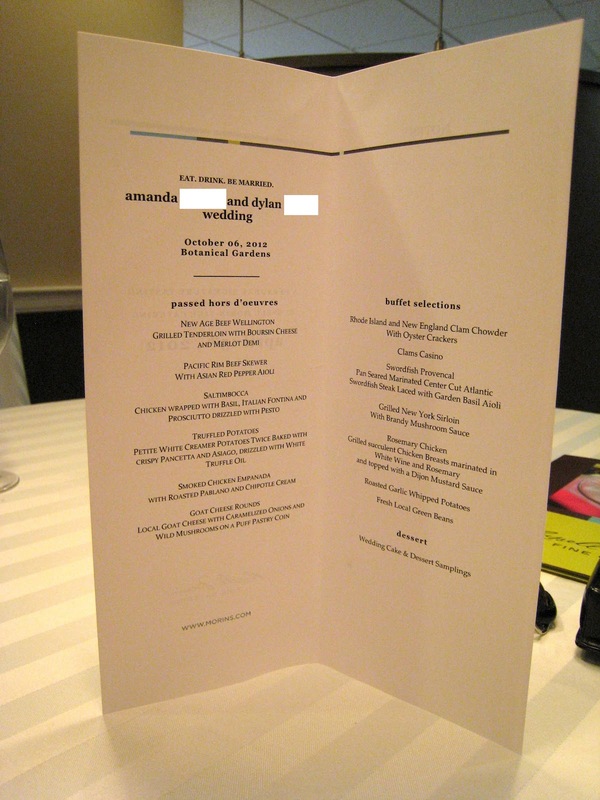 Our catering coordinator, Ashley, came out and introduced herself to us (we have only talked in email and on the phone) and said that the copy of the menu on the table was to remind us of what options we have chosen. After reviewing the menu with Ashley to make sure that everything looked right, she went back to the kitchen to let them know we were ready to start the tasting. Not even five minutes later, she was returning with our first plate of hors d'oeuvres. The first three of the hors d'oeuvres that we got to taste were the Smoked Chicken Empanadas with Roasted Pablano and Chipotle Cream, Chicken Saltimbocca - Chicken Wrapped with Basil, Italian Fontina and Prosciutto Drizzled with Pesto, and the Truffled Potatoes - Petite White Creamer Potatoes Twice Baked with Crispy Pancetta and Asiago, Drizzled with White Truffle Oil. In the picture below, you will only see the Chicken Saltimbocca on the right, the Truffled Potatoes in the middle, and some really spicy extra hors d'oeuvres they added. We ate the Chicken Empanadas before I remembered to get a picture - but they were DELICIOUS! The next plate that we received was the next group of hors d'oeuvres we decided on were Goat Cheese Rounds - Local Goat Cheese with Caramelized Onions and Wild Mushrooms on a Puff Pastry Coin and the Pacific Rim Beef Skewer with Asian Red Pepper Aioli. Both of these were delicious as well, although the Pacific Rim Beef Skewer was kind of difficult to eat since there was so much on the toothpick. The Goat Cheese Rounds were outstanding. And that is coming from someone who doesn't like mushrooms or goat cheese. These were probably my favorites. The last hors d'oeuvres that was brought to us were the New Age Beef Wellingtons: Grilled Tenderloin with Boursin Cheese and Merlot Demi. These were also delicious, and I can't wait to eat ten thousand of these at the wedding. After trying all of the hors d'oeuvres, we decided that the Pacific Rim Skewer was just too difficult to eat, and that we wanted to replace it with something else, so we decided on Baked Ricotta and Roasted Pepper Bruschetta with Sun-dried Tomato Pesto. We did not get a chance to try this, but our coordinator assured us that it was delicious, and I have no doubt of that. The next part of our tasting was the dinner entrees. We decided to go with a dinner buffet, as we want to give our guests the opportunity to experience many different types of New England Style food. First up, Ashley brought us out all the seafood options we chose for the buffet. We chose, Rhode Island and New England Clam Chowder with Oyster Crackers, Clams Casino, and Pan Seared Marinated Center Cut Atlantic Swordfish Steak Laced with Garden Basil Aioli. The chowders came out in mini mugs, with a clam cake on a toothpick resting on top. We were able to try both the RI style and NE style, and both were delicious. The clam cakes were some of the best I've ever had too, and I've had a lot of clam cakes in my 23 years of living in RI. The Clams Casino were also very good, and I'm looking forward to having some of those at the wedding too. The swordfish was my favorite of this grouping, though. Swordfish is one of my favorite seafoods, and the fact that it was served with a Basil Aioli made it even better (I have a slight obsession with anything with Basil). Out next plate of entrees was the non-seafood choices we selected: Grilled New York Sirloin with Brandy Mushroom Sauce, Rosemary Chicken - Grilled and Marinated Chicken in White Wine and Rosemary and Topped with a Dijon Mustard Sauce, and our sides, Garlic Mashed Potatoes and Steamed Local Green Beans. The garlic mashed potatoes had the perfect amount of garlic in them without being too overwhelming, and went very well with both the sirloin and the chicken. The sirloin was delicious, and even though I don't like mushrooms, they were also very good. The chicken was outstanding, and I wish that there were more. After our entrees, the serving staff gave us a few minutes to decide whether that meal was what we were expecting and if we wanted to change anything on the menu. We decided to keep everything as it was, because we had absolutely no complaints at all about the meals. Now, I believe that I have mentioned before that we are not having a cake, and that we are doing passed desserts instead. Well, they didn't really care, because they gave us a cake platter as well. This was a combine-your-own cake platter, which was very intriguing. They even brought out a little guide to the platter so that you knew what each cake, inside, and frosting options were. Some of our insides and frostings are in different places, but you get the idea. To go along with this, they also brought out some after-dinner dessert drinks, which were spiked with different alcohols. Not being a very big drinker, I tried these, but wasn't a big fan, as you can see from the picture below of my tasted drinks - essentially nothing in them is missing. Next, they brought out some of the passed desserts that we asked to try, since that is what we have opted for instead of a cake. The two that they brought us were a Peanut Butter Cookie Sandwich, and the Salted Caramel Whoopie Pies. The whoopie pies were one of the items that we had on our original list, but after trying them, we just didn't think that there was enough of the salt or caramel flavors, we we switched that dessert out for the peanut butter cookie sandwiches because OMG, they were soooo good. FI actually only let me have half of mine because he wanted more of it. Yeah, it was that good. After finishing up the desserts, Ashley came back to talk with us about our menu, and make note of the changes that we made. We also sat and finalized some other options, like linens and children's and vendor meals, but I'll talk about those things in another post. Instead, I will leave you with a picture of the demolished Cake Platter. Why aren't we getting a cake again? 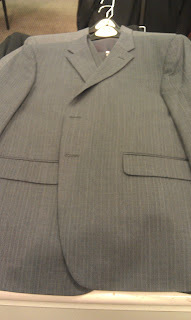 Friday, FI and I stopped by Men's Wearhouse to look at some suits. I had gotten an email about a sale that they were having on Jones New York suits, so we decided to go take a look at their inventory. When we got there, we were introduced to the wedding party representative, who was great. 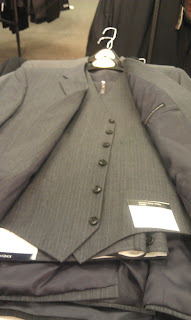 He took our information, and after we told him that we were looking for a medium gray colored suit, he said that there was only one that they had in store that could be applied to the sale and coupon that I brought. So, the representative brought it out for us, and it was a very nice gray pin strip suit, with a vest. The vested suits were an added cost, but still applied to the sale and the coupon. The suit was the perfect shade of gray, although we weren't really looking for pinstripe because we were afraid that it would clash with the ties that we had picked out. FI tried the suit on anyways, and it actually looked great! FI loved the way that the suit looked, as did I. We also tried the jacket on with the vest, and it looked really nice too, although we are undecided right now as to whether or not we will use them at the wedding. We still have a lot of time to decide. I forgot the camera, and actually didn't remember to get pictures of FI in the suit, but I did remember to get some of the suit with my cell phone camera. Sorry the quality is not that good. Well, shopping for the men's attire this weekend didn't happen, unfortunately, so we will have to keep an eye out for the next BOGO sale at Men's Wearhouse and make sure we go. Not sure how many more of those will happen before the wedding, but we definitely want to take advantage of those. 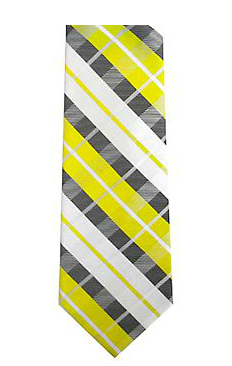 In the meantime, however, I think I finally found the men's ties. 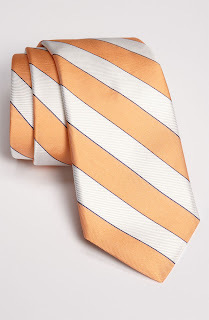 I have been shopping online for months now, looking for ties, and have not been successful in finding anything. The thing is, I wanted the ties to match for 3 different people: Groom, BM/GM, and my dad. And by match, I don't mean that they will all be in the same color. 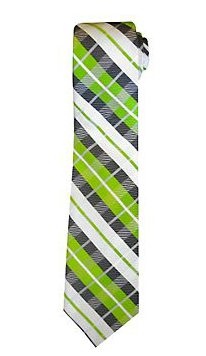 I mean that I want the ties to be all the same pattern, but different colors. I decided a while ago that FI was going to wear yellow, since that is his favorite color. 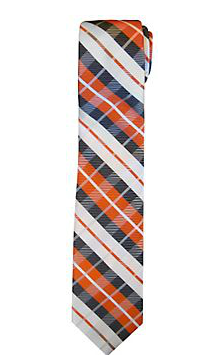 To match my MOH/BM, the BM/GM would wear green ties, and then my dad would wear orange, since that is my favorite color, and a color my mom looks great in (more on her dress in a few weeks - we haven't exactly gotten that one figured out yet). So, I searched and searched and searched. And then I searched some more, becuase the problem I was having was that I could find the same tie in two of the colors I wanted, but there was always one missing. Available in orange and yellow, but not green. This is what I have been finding for months, until now. I finally found a tie that comes in the colors that I need, so I ordered them. 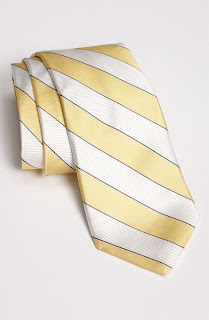 The colors look really bright on the computer, but I can return the ties if we don't like them. I'm just waiting on them to come in now. And, I am also waiting on the swatch from the BM Dress designers, so I can compare the greens. I doubt that they are going to match perfectly, but I think that as long as they don't clash too much, that we'll stick with these. I think they're kind of funky and cool. What are your thoughts? Are you color coordinating your groom and groomsmen? And, is it weird that I want my dad to match even though he's not technically a part of the wedding party? We've reached the 6 month mark! Most of the wedding to-do lists have a lot of things to cover between this point and the wedding day, and I am so excited to finally be able to start working on some more significant items for our wedding. Oh, and in case you haven't noticed, I've added a To-Do List page, where I will be crossing items off, and linking them to posts that I've written. This will hopefully keep you updated, and is an easier way for you to find a past post of mine, since it somewhat categorized them. There's only one thing holding me back. School. I only have 12 more days left in this semester before all my assignments are due (and no finals!!!) so I have to really focus on that for the next almost two weeks, and then I can start giving the wedding a bit more attention. This weekend we are probably going to go suit shopping for the Mr., since Men's Wearhouse is having their BOGO sale. If we do, I'll be sure to get some pictures, even though FI will likely want any taken. FI and I have not decided on a honeymoon location yet, and there are so many reasons why. Since you already know how much of an indecisive person I am, this should not be much of a shock to you. I have been thinking about our honeymoon for years, and honestly, so has FI. We both talked about how awesome it would be to travel to a bunch of different cities and countries in Europe and really get to see the sights. We are planning on starting a family a year or so after our wedding, so being able to take an epic journey to so many different places early in our marriage would be ideal. FI has been to England, France, and Italy before, and I've only been to Argentina and the Bahamas. Together, we went to Russia as part of a trip with the touring choir in college. As you can see, traveling is not something we have done a lot of together - in fact, we've never even been on a vacation by ourselves before. Everything has been with groups of people or other family members, so this honeymoon will be our first vacation together in almost 7 years! Our original plan was a 13-city tour of Europe. 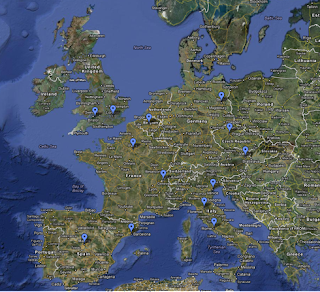 We would travel throughout Europe, spending almost 4 weeks on our trip out there. Map created via Google Maps / Cities include Rome, Florence, Venice, Vienna, Prague, Berlin, Brussels, London, Bath, Paris, Geneva, Barcelona, and Madrid. I don't want to go somewhere everyone else is going, i.e. : Carribbean, South America, Central America, Mexico, etc. Now, taking money into consideration, there aren't that many other options, especially if we only have one week for a honeymoon. So, we've been entertaining the idea of a mini-moon right after the wedding, that way we can just take a few days to ourselves to bask in newlywed bliss, and then take a longer honeymoon in either the spring, or around our one-year anniversary. However, this makes things even more difficult, because it makes me have to decide on two different honeymoons, and decision making is not my strong point when there are other parties involved. Considering a mini-moon would only be a few days, it would be best to stay in the New England area, but where? Do we stay in Maine? Do we travel to a resort in Vermont? Do we rent a little house on the Cape? And for the big honeymoon, do we save vacation time and money over the next year and take our dream tour of Europe? Or do we decide to do something a little more exotic and go on a Safari in Africa?